Our county’s vibrant and diverse food & drink scene has made Cumbria a must-visit destination for foodies in recent years. Local food festivals and farmers markets have flourished as a result but now a group of innovative food & drink producers want to join forces to take Cumbria’s finest to the national stage at the NEC Farm and Deli Show in April 2019. The seed was sown at this year’s Farm Shop & Deli Show in April when a small number of Cumbria-based food & drink businesses exhibited their produce to an audience of 30,000 trade buyers over 3 days. Despite their independent successes, they noticed the gathering crowds of buyers at the large county and regional stands and the idea of the ‘This is Cumbria’ initiative was born! With collective efforts from Jacqui and Keith Jackson at Thomas Jardine & Co, who specialise in generational food businesses and food entrepreneurs and Sue Howorth from The Family Business Network Ltd, the project has been launched to offer trade stand space and sponsorship opportunities. Speaking about the initiative, Keith Jackson said “Maria from Hawkshead Relish and Lisa from Gingerbakers has secured the best location for our ‘This is Cumbria’ stand adjacent to the Live Stage to help us to create a real buzz and curiosity around the produce, but also to offer a unique one stop shop for buyers, retailers, distributers and suppliers to come and experience a taste of Cumbria”. Already working closely with many Cumbrian food and drink business through The Family Business Network, Sue Howorth commented “The ‘This is Cumbria’ stand represents great value and a one-off opportunity for those new to the world of exhibitions or for businesses with tight marketing budgets to sell more products nationally or internationally. We are offering a range of stand sizes from shared space which is ideal for first-timers, to larger stands for the more established”. Other incentives for joining the Cumbria stand will include the sharing of logistics and travel costs, collecting buying power for show sundries, plus the use of a dedicated central meeting space within the stand for exhibitors to meet and talk with potential customers and trade press. Maria Whitehead MBE of Hawkshead Relish plans to hold a Masterclass prior to the Show to offer advice and support to fellow Cumbrian exhibitors on how to get the best from the show. 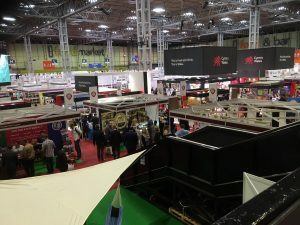 Speaking from experience, she commented “This is the sector’s leading event and it brings together over 450 exhibitors which attracts thousands of key buyers from the food and drink retail market over the three days. It gives us a brilliant opportunity to launch new products, generate new sales leads, network and meet with existing clients and to generate some good PR coverage. We hope that this unique opportunity will encourage local businesses to join us and exhibit next year alongside like-minded Cumbria producers”. The Farm Shop & Deli Show takes place at the NEC from 8-10th April 2019. If you are a Cumbria-based food or drink producer and are interested in reserving trade space, please contact our ‘This is Cumbria’ project coordinators, Keith and Jacqui Jackson via email [email protected] The team are also inviting businesses to join the venture as a Sponsor of the ‘This is Cumbria’ stand.